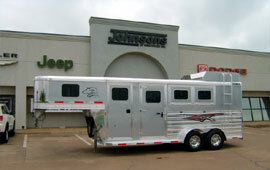 Welcome to Johnsons of Kingfisher Inc., Oklahoma's premier horse and livestock trailer dealer. 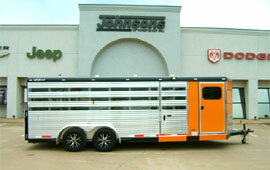 Johnsons of Kingfisher, in Kingfisher, Oklahoma, is a dealer of quality trailers from Exiss, Sooner, and Haulmark Trailers. 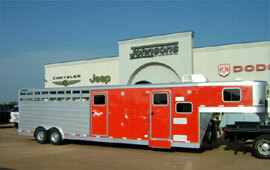 We have a large inventory of horse trailers, horse trailers with living quarters, livestock trailers, stock combo trailers and Haulmark trailers, both new and used. We will try to provide you with the lowest price and the best customer service. 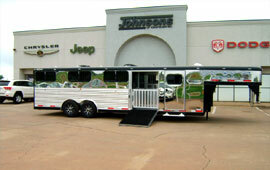 We are located just 30 minutes northwest of Oklahoma City and 40 minutes just south of Enid, Oklahoma. Our friendly and highly knowledgeable staff is dedicated to your satisfaction; visit us today at 1801 S. Main Street and see for yourself! Copyright 2019© Johnsons of Kingfisher Inc. All Rights Reserved.